KLM has a great sale for air from Amsterdam to Bonaire for the spring. I found some fares for around 500.00 Euros round trip! To celebrate these special prices, I am offering 5-10% off select properties when flying KLM. This applies to new bookings only. Ask me how! Note:	Schedules subject to change without prior notice. Bonaire is fortunate to be the refueling stop for the MD 11 KLM heading to South America. For 300 USD pp and a quick 2.5 hour flight we can arrive in Ecuador. Maggie was celebrating her 18th birthday and wanted a trip to Italia. Unfortunately the air from the US and Bonaire was well over 1600 USD so I decided to take us to Ecuador. My Dad was stationed there in WWII and I recall his stories of the beautiful people and country. I booked us for 5 nights. Next came the plan to decide where to stay. Being a travel agent and with a social work background I am overly investigative…I knew I wanted mountains, waterfalls, cool temps and away from it all. I found three Haciendas and let Maggie choose. She chose Primavera in the Cloud Forest, close to Columbia. I also wanted to spend 2 nights in Quito to visit the museums and cathedrals. I had researched a trip a few years back and knew I wanted to stay in Old Town Quito at Cafe Cultura. We woke at 2:30 AM and drove 3 min. 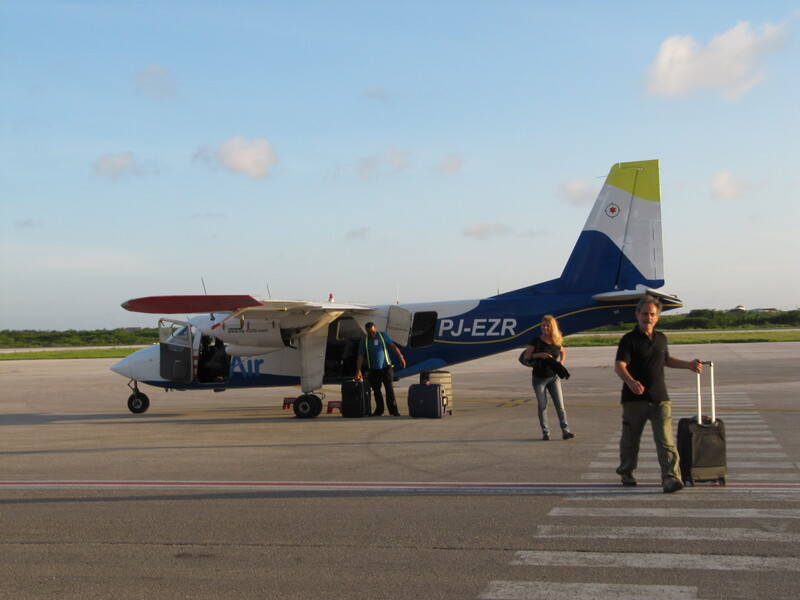 to Flamingo Airport in Bonaire. We were one of 3 parties flying from Bonaire to Ecuador. We waited in the departure lounge as the KLM landed 3:04 AM. To refuel all the passengers (embarked in Amsterdam) deplaned. The masses headed to the smoking lounge and the bathrooms. Most of the passengers were South American and some back packers heading to the Andes and beyond. We loaded the plane. What comfort. The MD11 had 3 -3 -3 seats and was very roomy compared to the US 737’s I frequently fly. We took off heading south. I slept the entire flight to Guayacil where we off loaded some passengers and took on more who were heading back to Amsterdam. 20 min. 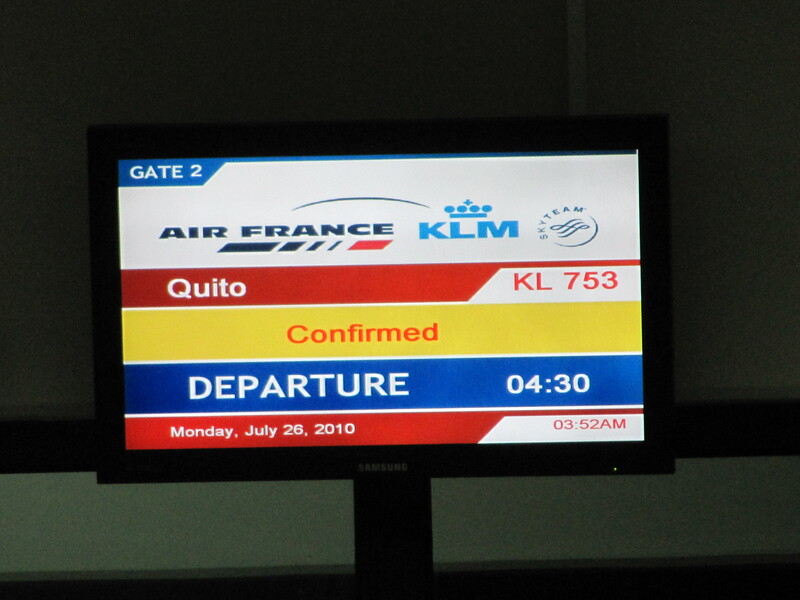 later we arrived in Quito. The airport was very efficient and in the arrival hall our guide Armando and our driver Christian were there holding a sign with my name. As we left the airport a group of very forlorn ill kept beggars hounded me until we got to the car. It was rather unsettling as the tiny child kept saying the same phrase over and over..what I am not sure…it was a prayer or something. As we drove I noticed the smell of diesel and exhaust was overbearing. I also started to develop a massive headache. I knew to possibly expect Altitude Sickness being 9200 feet above sea level. The traffic was heavy at 8:30 AM and the sights already astounding. We saw many local people dressed in traditional Indian clothing. There were many motorcycles as well. I saw a lot of dogs but none really skinny just dirty. We stopped to get gas and I took the opportunity to go to the bano. As I stepped out of the van I noticed I was very dizzy. I felt like I was on drugs walking on pillows. 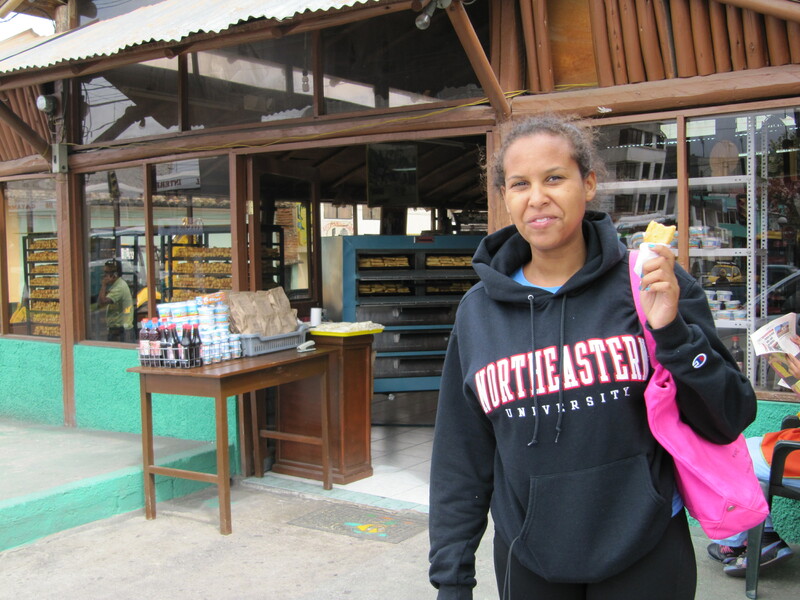 We bought some water and corn pancakes in the store and headed towards Otavalo. Along the way we stopped in Cayambe City for Bizcochos, cookies the area is quite famous. There were rows of stores selling the cookies but Armando chose the best spot. They were buttery good. Our next stop was the Equator. Maggie was disappointed as this point was not the huge tourist center near Quito but a smaller version. Still, we stood at 0′ and listened to a small lecture from a local girl. Cayambe is famous for growing roses. We saw greenhouses all along the road as well as many Indian local people. It was wonderful and so different to see the clothing and diversity. 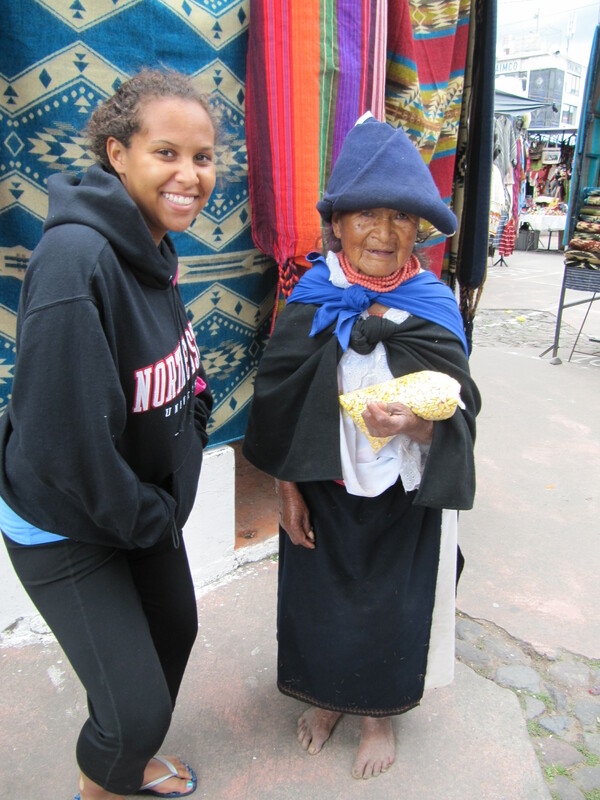 2 hours later we were in Otavalo a market center. Famous for it’s weavers there are stalls and stands with a colorful array of designs and fabrics. Saturday is the busy day but we enjoyed our quiet shopping choosing some lovely scarves (2 for 5.00 ) and a lovely hammock for 12.00. Starting 15 January 2010, tourists who want to travel to Bonaire on a Friday will have an additional flight to choose from. Because KLM is adapting its flight schedule. This means that the Amsterdam – St. Martin – Bonaire flight (AMS-SXM-BON, KL0763), which currently operates every Thursday, will be moved to Friday. This change has already been included in the reservation systems as of this week. KLM and the Tourism Corporation Bonaire hope that this change in flight schedule will increase the number of seats on this flight, since many tourists prefer flying at the end of the week. 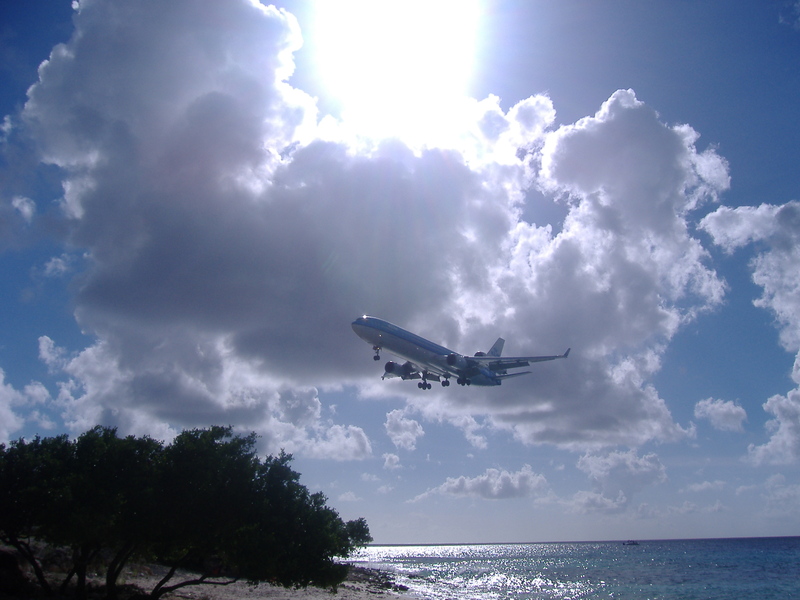 As of 15 January 2010, KLM will operate six flights a week to Bonaire. My Favorite Past Time In Bonaire..and..
apparently Geoff and Carlea’s too..